FP5061B = ARK-501+, Black(ADD USD$39.00)FP5061B/L = ARK-501+, Black,120" CableFP5061M = ARK-501+,3X4,BLACKFP5067B/L = ARK-501+,BEIGE,120",CBL. 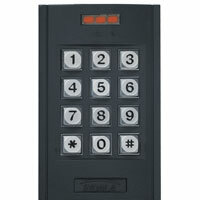 The Indala 125 kHz Keypad Reader product line is part of HID's latest line of highly-secure proximity readers. HID Indala offers two Keypad readers with FlexSecur technology that combine both a proximity reader and keypad in one small, attractive package. With a read range of up to four inches, Indala Keypad readers are ideal solutions where additional layers of security are specified, such as in a lab or corporate research environment. All HID Indala 125 kHz Proximity Readers feature FlexSecur technology which provides an added level of access system security through a verification process at the reader. A feature unique to the HID Indala product line, FlexSecur screens out unauthorized cards prior to sending access control data to the host system. Read range up to 4" .